The traditional sit-down dinner service has always been the most popular type of dinner service, irrespective of the event type. Most plated dinner service menus include three courses separately served by waitstaff that are experienced in this type of service. Guests can usually make a choice from two to three entrees, stating their preference when they RSVP to attend the event. Plated dinner service is formal and elegant, and suitable for most high end events – from wedding receptions to political fundraisers. Contact Us at 858-488-1725 to create your exceptional Sit Down Plated Dinner Party Menu. 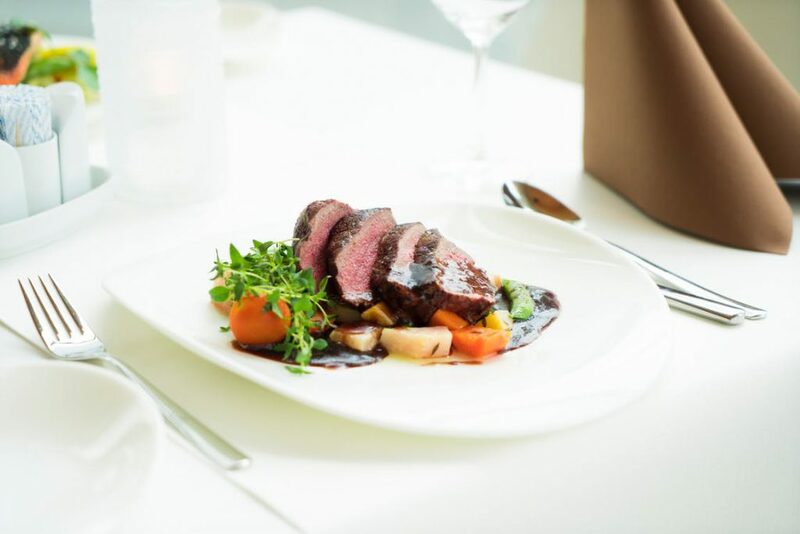 PROS – Guests are served at the same time, allowing you to better manage the time allotted for dinner service. You can also collaborate with our catering staff over menus, giving you greater control over food costs. CONS – Plated dinner service requires more servers, increasing the labor costs associated with your event. With a pre-set menu, food choices are inherently more limited so guests with special dietary needs may find the menu options don’t accommodate them. Your guests will enjoy 2 items as a main course served in the style of a surf and turf.